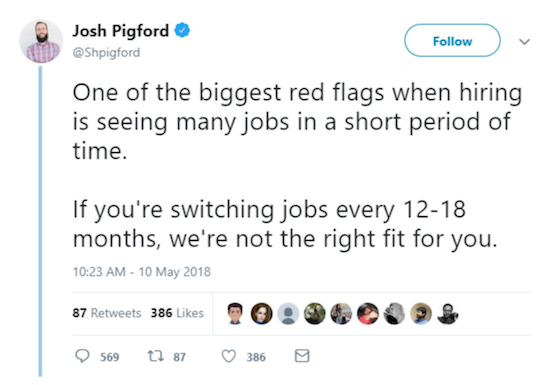 Recently, there was someone on Twitter who claimed that switching jobs every year is a hiring red flag. I would link it, but it was a terrible (and hypocritical) take, and he took an extremely defensive stance until he tried to pretend he hadn't meant it. Some people shared some thoughtful reasons why they have changed jobs in under a year, and it got me thinking about my job evolution. I've been privileged enough to be able to switch jobs when I wanted, but I have many friends who are perpetually unhappy in their jobs and are afraid to start the search. I get it, job searching is almost a full-time job on its own, and rejection doesn't make an already depressing work situation any better. But recognize warning signs and red flags, and prioritize your mental sanity. I've quit jobs reluctantly and quit jobs ecstatically, but ultimately, it's because I've prioritized what I want in life. The list is not organized chronologically. Sometimes a job just isn't right. You get excited, you start, and it's either not what you expected or something happens to the company, and priorities shift. At this job, I was excited about the industry and the potential to take my career to the next level. My co-workers were dedicated, intelligent, and friendly, and I would work with most of them again in a heartbeat. However, it quickly became apparent that their goal for a startup was more to fund their lifestyle instead of building a business to make a change to an industry that I felt desperately needed changing. When they stumbled across a major problem that had growth implications, instead of pivoting to solve the underlying problem, they wanted to find another problem their solution could solve. In just under three months, our independent source of revenue fell to $0 in 48 hours. It would take a couple of months to rebuild that stream of revenue, but it would mean not focusing on our core industry and changing my role, which is not something I was interested in. According to a recruiter I once worked with, leaving an "oops job" is perfectly acceptable in under three months. I cried for hours when I quit "the rut" job. I still tear up thinking about leaving the company and happily encourage people to apply. I joined as employee 20-something and stayed until the company was almost 100 employees. The CEO and my manager were great, my co-workers were great, our customers were great, and I was proud of the product I helped build. It was because my manager was amazing that he recognized that I wasn't growing in the role anymore, and no longer growing in my career, which was important to me. We had a long talk where he encouraged me to transition out in the coming months. Sometimes a company, especially a startup, depends so much on certain skill sets that they're afraid of trying to get someone else to do the work, and I think that happened here. That's life. Unwinding after a stressful day is important, and I didn't have that at this "isolation" job. I was in a remote area where I didn't know anybody, and my values were different from those around me. It's hard to find people to bond with when their priorities are family, football, fishing (and hunting), and faith . . . and you're single, not into sports, and not religious. I enjoyed this job, but the stressful days just kept building on each other, and I had no escape. I had terrible managers at this job, both male and female. They would do things to make themselves look good to executives, even if it meant throwing their direct reports under the bus. It also became apparent that male colleagues were getting raises faster, promotions faster, and projects that would lead to those. They were getting promotions and raises for things I actively helped them on, or even things I did the work on. There also was a pay gap emerging between me and male colleagues of my skill level. This was not what I envisioned or signed up for. I got word that I was accepted to a startup boot camp, so this job came to an end. If you think you may have landed yourself one of these jobs, talk with someone about your concerns and figure out a way to either make it better, or move on. The initial CEO I worked with had a policy against hiring the best. He just needed "good enough." The replacement CEO had a toxic network and management style. Diversity suggestions were ignored. The majority of my co-workers were blonde women, and all the company ads portrayed the same, ignoring suggestions to do otherwise from business partners. There was no one I admired or looked up to. Nobody in leadership wanted to make a decision, which resulted in rework and shortened timelines. Everything was done on feelings, not data or research. I could not trust my manager. Free alcohol Fridays and free lunch once every two weeks doesn't make up for the lack of respect. Through job hopping, I've learned it's important to work for employers who value team-players, as well as your growth and career goals as an employee. Don't stick out a job because you are afraid of what job hopping will look like on your resume. Years ago, job hopping was viewed as not being a loyal employee. Today, it's viewed as being a go-getter or going after the best opportunity to advance your career. And that's desirable for employers.